"The future program of Metropol Cinema: The first eastern film dubbed in Persian which will be shown at a first-rate cinema equipped with a panoramic system. The musical comedy 'I want a husband', starring the best eastern actors -- Laila Al-Jazairi (the leading actress in 'Farouq'), Nour Al-Hoda (the leading actor in "Berlenti", Farid Al-Atrash (the most famous eastern singer) -- is an excellent comedy with first-rate dubbing by Studio Central." 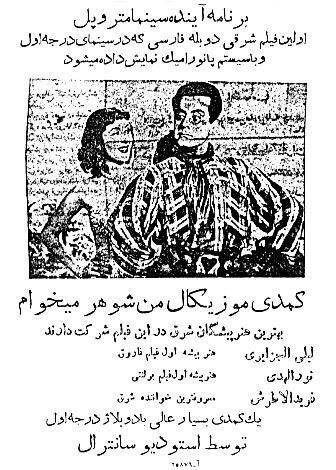 Published in Ettela'at, January 28, 1956. Thankls to Pedram Missaghi, "Iran Media"